To all the brothers and sisters who probably asked yourself how do the Dept. of Puerto Rico works or is form. Well I’m enclosing information that may be useful for all of those who may want to see what DAV is all about and how it works. We have twelve (12) chapters thru out the Island and these are the days and hours of their monthly meetings. 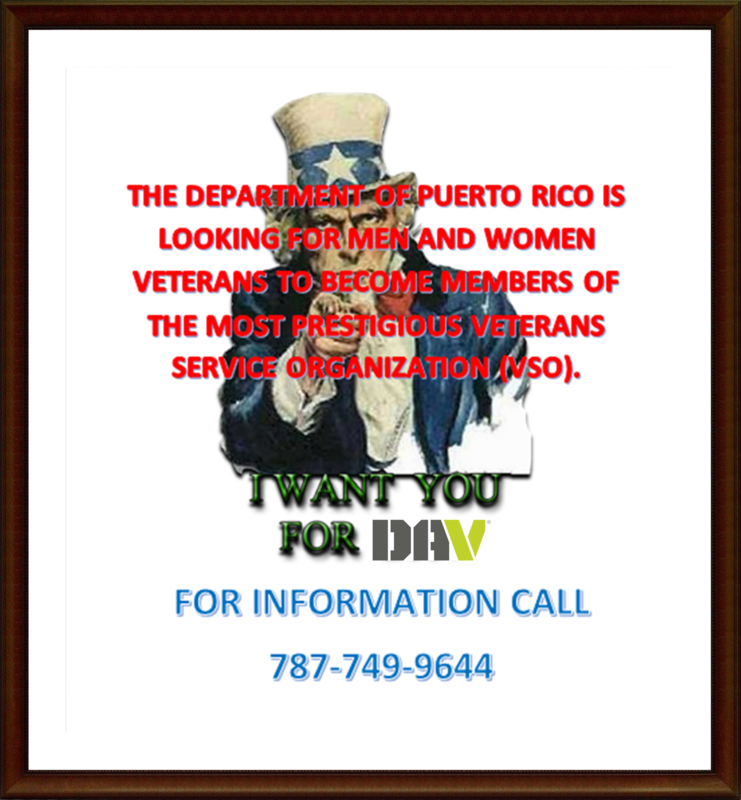 It is very important that all chapters meet monthly except Bayamon, they meet by monthly. 1 First Sunday Arecibo meets at 1:00 pm, Isabela 1:30, Aguadilla 2:00 pm and Fajardo 2:00 pm 2 Second Saturday San Juan meets at 10:00 am Arroyo 1:00 p.m. 3 Second Sunday Cabo Rojo 12:00 pm San German 2:00 pm Patillas 11:00 am Caguas 1:00 pm 4 Third Saturday Ponce 9:00 am 5 third Sunday *By monthly Bayamon at 2:00 pm This information is being brought to you according to officers report provide it to the Department by each chapter.